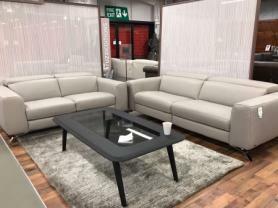 Natuzzi Private label Italian Protecta thick leather 4 seater , 3 seater including footstool. High back and soft seating make this the perfect sofa for any home. Italian thick protecta leather all over, durable and easy to clean. Different combinations available please call for further information.